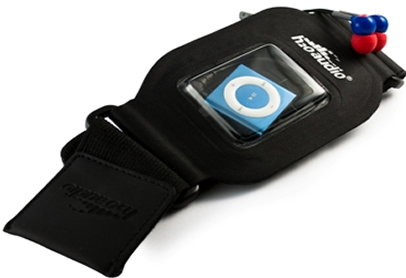 Waterproof iPod armband that fits iPod nano 6th Gen and iPod shuffle 2nd & 4th Gen and other small MP3 players. H2O Audio Amphibx Fit Small Waterproof Armbands. 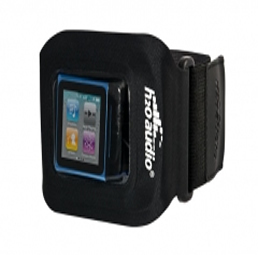 H2O Audio is able to offer the ultimate hybrid of waterproof MP3 case and sports armband. The Amphibx Fit small armband provides waterproof protection and functionality in an armband thats light and streamlined. Designed for high performance and comfort in the water or out, the Amphibx Fit line of waterproof iPod armbands are perfect for anyone looking for wearable protection for their iPod nano 6th generation, iPod shuffle 2nd & 4th generation and other small MP3 players. The patented LatchTight locking closure and SealTight headphone connector provide a secure seal up to 12ft/3.6m underwater. Each H2O Audio product is individually tested to ensure it is 100% waterproof. Ergonomic curved design and removable breathable Velcro strap. The Fit provides protection from sweat, humidity and moisture in an armband so light and comfortable, you'll barely know it's there. Weighing only 2.9 ounces, it's the lightest armband we've ever made ! Quick and easy to load, the ClearTouch pouch allows for the full function of touchscreen and button features giving you great functional protection in and around water. Adjustable Velcro armband fits most arm sizes. Remove the armband from the sturdy D-rings to throw the case in your pocket or gym bag. Even with the device inside and armband attached the Amphibx Fit will float. Fits small iPods like the iPod nano 6th Gen, shuffle 2nd and 4th Gen, and other small MP3 Players. Headphones are bought as a separate item.